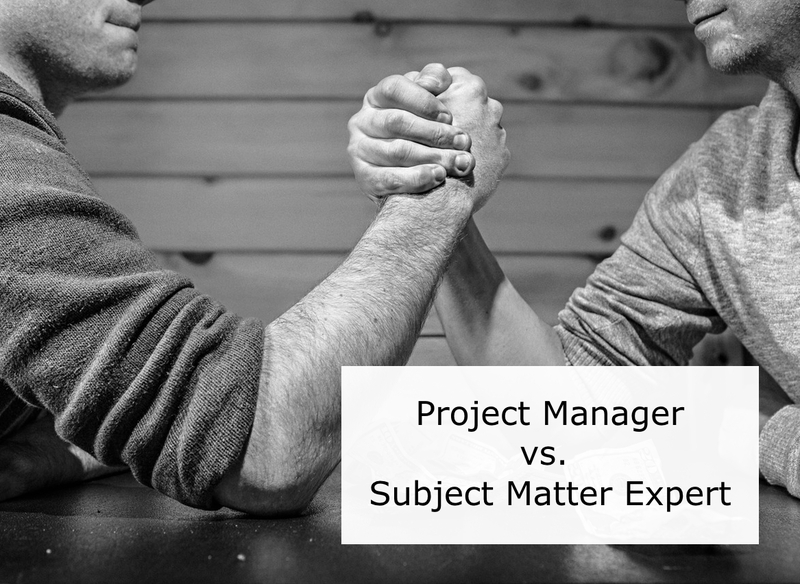 It’s the age old question: is it better to have a project manager or a subject matter expert (SME) leading a project? You will find heated discussions on this subject in various PM forums and groups, with each side presenting very convincing arguments. The first thing to remember is that these two roles are not mutually exclusive. You can be a project manager and a subject matter expert at the same time. In fact, in many organizations that is often the case. So the question should actually be: is it important for a project manager to have in-depth knowledge of a field or industry, or not? Let’s look at what speaks for professional project management skills as the most important skill a PM needs. By definition a project is a temporary endeavor. A project manager’s job is not to actually work on the project but to manage it, and to choose the best people for the job. To manage a project, you don’t necessarily need in-depth knowledge of the subject matter as you will have a specialized team to fill you in when necessary. It’s often actually beneficial to the project if the project manager doesn’t have the technical know-how as he will have an unbiased view and is able to keep the big picture in mind instead of getting too involved in the details. Project managers without subject matter knowledge can reduce the risk of scope creeps as they are less likely to get too occupied with perfecting the product or service, thus adding to the project scope. Instead their priority is to ensure that all project objectives are met. A big part of a project manager’s job is to communicate, not just with the team but other internal and external stakeholders (such as clients, project sponsors, or upper management) who will often have only broad or even very limited knowledge of the subject matter. The project manager can act as a mediator and explain the project to them in plain language instead of inadvertently using technical jargon. Subject matter experts have in-depth knowledge of the industry they work in, know exactly what the best practices are, and what technologies are in use. They also know the processes and the inner dynamics and workings of the team. In case there is resource shortage or time pressure, they can easily jump in and help the project move along by taking on tasks themselves. It is almost impossible to make accurate estimations or set realistic deadlines if you don’t understand the subject matter. A good project manager should be able to create a project plan and schedule without a deeper knowledge of the subject matter as he can rely on the estimates of the team. But this is often cause for disagreements, as the PM might underestimate the time it takes to finish tasks and set unrealistic deadlines that the team won’t be able to meet. A SME knows exactly what the workload of the team is and whether their estimates are realistic or not, thus can plan more accurately. This is probably the most convincing argument in favor of subject matter expertise: better problem solving. A SME understands issues and problems better and more quickly, and as a result they are able to come up with solutions more easily. But they don’t just understand the subject better, they also understand the team better. More often than not a subject matter expert has once been in their position so they can empathize and communicate with the team members better than someone without subject matter knowledge. It’s clear that each side has good arguments. Both roles add value to projects and companies, but which one should you choose? The answer is, as with many things in life and business: it depends - on the industry, on the business, and on the individual. In some industries, it’s advisable to have a project manager who has the necessary subject matter knowledge, e.g. in construction or manufacturing. But keep in mind that there’s always an exception to the rule, there are many PMs who have managed successful construction projects without industry and subject matter knowledge. In the end it’s all a question of results: will a project manager with or without subject matter expertise add more value to the company? What if you still can’t decide? Then there’s a third way, have a project manager and a SME working side by side on the project. The project manager will be able to make more accurate estimations and plan for potential risks with the input from the SME throughout the project lifecycle. This way, you’ll have the best of both worlds. How to Get Hired in 2019: Explore your I, T or X-shaped Personality! Back to Basics (Part 2): Project Manager versus Subject Matter Expert - InLoox • Copyright 1999-2019 © InLoox, Inc. All rights reserved.